How long has Person of the Year been around? It has a great origin story—or maybe more of a legend. At the end of 1927, the editors of TIME looked at the year’s covers and realized they had somehow failed to put Charles Lindbergh on the cover. He’d done his historic flight in May, but no cover. They decided they could get away with putting him on the cover months later by calling him “Man of the Year.” It was a stopgap. And here we are 87 years later. The challenge is that on one hand, we’re trying to make a decision about who best represents the news of the year. But the pick also needs to have archival value. You need the sense that it will stand the test of time. So ideally, we want our Person of the Year to be both a snapshot of where the world is and a picture of where it’s going. Someone, or in rare cases, something, that feels like a force of history. Tell me about the ‘for better or worse’ caveat that’s often attached to Person of the Year. The criterion is “the person or persons who most affected the news and our lives, for good or ill, and embodied what was important about the year.” A lot of news is bad news and a lot of people who make bad news are very powerful people. TIME’s editors aren’t immune to that reality. Famously, they named Hitler in 1938 and Stalin in 1939 and again in 1942. These were men who had a huge impact, not just in those years but over the entire century. It’s easy to stand by those choices, looking back. Arguably you could do a bad guy every year and be justified. Earth isn’t a person and neither is the personal computer. What’s the deal with these inanimate objects? It’s a good question. What I hear anecdotally is that readers are most satisfied when the Person of the Year is a person. Sometimes it’s been a thing; sometimes it’s been a collective. In 2011, it was The Protester, a sort of representative figure. We thought long and hard about that. Could we execute it in a way that would be satisfying? Would people understand what we were trying to say? We decided that we could, and they would. I think the personal computer really stands up. Although Steve Jobs was profiled for that issue, and you could argue the editors might have been more forward-looking had they named Steve Jobs for that year, 1982. Is that something you hear a lot? Why wasn’t Steve Jobs ever Person of the Year? Definitely, particularly the year he died. To me the optimal year would have been 1984, when the first Mac came out. The 1984 Person of the Year was Peter Ueberroth, who ran the Summer Olympics in Los Angeles. Looking back, it’s easy to judge, but that would have been a good year for Steve. How secretive is the process of putting together the issue? It’s a really fun journalistic property and I think a lot of fun leaks out of it if people have a sense of who it’s going to be. We have runners-up in the issue, so there are a number of stories in the mix each year, and we have to stay flexible, given the nature of the news. Very few people on the staff know who the front-runner is, or even the short list. Really only the people for whom it’s necessary to know, know — including a small circle of editors and the writer working on the story. Layout meetings are held in secret. This is my fifth year editing it and I’ve developed a good poker face. Is it true that the announcement is made before the cover goes to the printers? Yes, this year the announcement will be made on the Today show and to TIME’s 6.5 million Twitter followers on the morning of Dec. 10, as the issue goes to press. It goes live on TIME.com immediately, and our plan is for readers to be able to download the tablet edition on the 10th as well. Do you feel outside pressure to make a certain choice, especially with social networking and the Internet? We invite it, because we do this online poll, which is extremely unscientific. Response to the Person of the Year issue tends to be very focused on whom we put on the cover, but the issue is also our take on the entire year in review. The poll is part of our effort to remind ourselves and readers: these were the things that happened this year and these were the people who made them happen or the people to whom they happened. Certain narratives start to present themselves just through that group of names, about business or technology or human rights or culture or politics. What’s nice about the poll is that we get an unregulated sense of who piques the public’s interest. And while we don’t make our selection based on the poll results, it’s always interesting to see where some of our preferred candidates end up. People always seem surprised to see entertainers like Taylor Swift on the Person of the Year poll list. Can you talk about why pop stars are included? TIME has always covered news in its broadest sense. 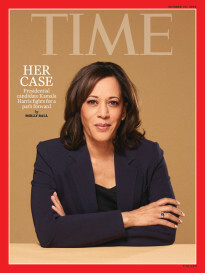 Working on Person of the Year, I’ve spent a lot of time in the archives and I learned that for the first four decades of its life, TIME put a person on the cover every week. There were a handful of exceptions (a horse, a flag, the city of Paris), but otherwise every week you’d see person on the cover—that’s part of the magazine’s ongoing legacy. Those people are not always world leaders or presidents of the United States or CEOs. Sometimes they are Julia Child or Woody Allen or Charlie’s Angels. And some of those covers are the most enduring covers of TIME. I do think there are arguments to be made for cultural figures. They don’t impact the news in the same way a dictator would, but they certainly signal something about where the world is at a given time. If people remember 2014 as the year of Beyonce, I wouldn’t say that’s entirely wrong. Do you have any Person of the Year choices you find inspiring or unusual? I’ve become partial to You from 2006. It’s a great issue. 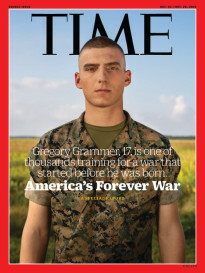 It gets a lot of flak because of the Mylar cover, but if you go back and read that issue of TIME, it’s a very strong statement about what was happening with user-generated content. I also like the “25 and Under” issue from 1966, partly because it has a great composite illustration on the cover, which is hard to pull off, but also it was a clever move to identify what would later be known as the Baby Boomer generation at that moment. Any hints for this year?